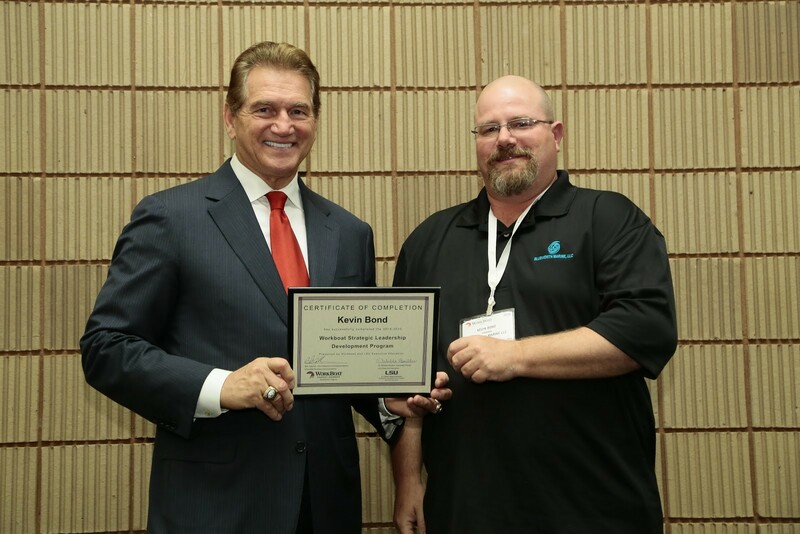 Bludworth Marine Pays It Forward at The 2015 International Workboat Show | Bludworth Marine, L.L.C. Last Month, Bludworth Marine attended the International WorkBoat Show for the fifth year in a row. The IWS is always an exciting event for the Bludworth team; it’s a time for us to enrich our personal and professional relationships with our customers and vendors. This past show in the historically vibrant city of New Orleans allowed everyone to enjoy themselves while we networked, spoke, and learned about what’s in store for the maritime business in 2016. We partnered on a co-display with our Japanese ATB partners, Taisei, and afterwards, enjoyed some of The Big Easy’s world-class food and entertainment with our customers. Needless to say, everyone had a great time. But what made the 2015 International WorkBoat Show special to us was watching two extraordinary students, Kevin Bond and Lorenzo Peña, as they graduated from LSU’s WorkBoat Strategic Leadership Development Program. Bludworth Marine Owner and Founder, Richard Bludworth, sits on the advisory board of the WorkBoat Leadership Program where he provides mentorship and guidance to these outstanding students, leading them on the professional path to becoming the responsible, hard-working managers the maritime industry needs. We believe it’s our responsibility to invest in the industry as a whole, and we take this commitment as seriously as we do our commitment to our own customers. The International WorkBoat Show and programs like LSU’s Workboat Leadership Development Program are invaluable to our industry. We look forward to attending next year's WorkBoat Show and contributing to the future of the maritime industry any way we can for years to come.